this is brilliant! as a new gardener I'm excited to try this out! Hot dang!can someone help me out here? Cool, good luck with your garden this year!!! 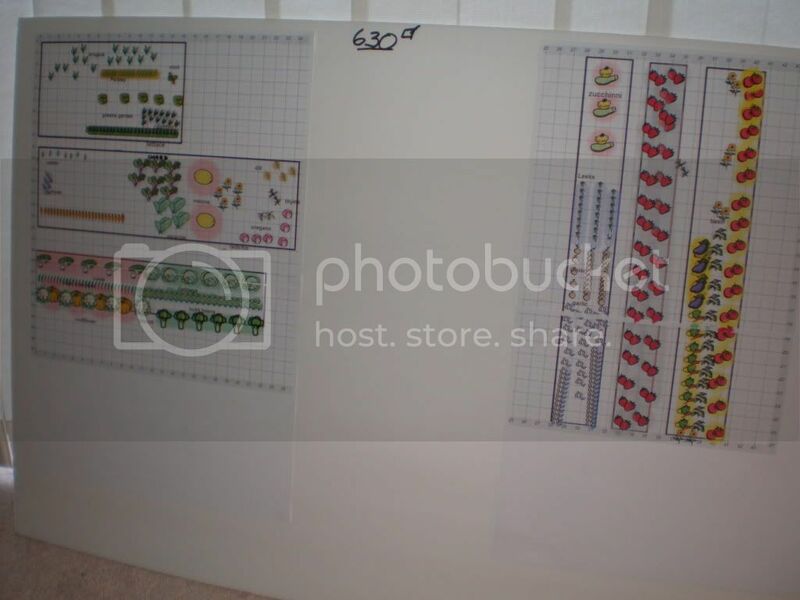 As you can see (finally), I have printed out my plans and mounted them on one of those styrofoam poster boards from the dollar store. I measured all my plots and put the total at the top for the sake of amendments to the soil-you know 4 cups per hundred square feet, that kind of stuff. I really like looking at the colored picures, makes me feel like something is happening. Thanks duh_vinci, if my uploading of photos is any indication, I will need all the luck I can get! Color is always good! And when that color would appear in your garden - happiness would really shine through! As for the images - just hover the mouse over the picture in the album of photobucket, drop down menu comes at the bottom, copy entire string next to "IMG code" sign, and just paste it directly into the post. Don't feel bad Gerrie, many of us cannot post photos in forums, I simply give the link to my photo bucket account... And only have garden stuff in the photo bucket gallery.... since I can't post to forums either. I have been checking out the many tools online for planning out the garden also... Looks like you did a lot more than just look! Hey, growing a garden, and posting pics on forums are not the same thing at all! It's fun to play with but I wouldn't use it to plan out my gardening, I'm not sure they've really got all the spacing right . Do you think the spacing is too close? Some too close some too far, or maybe I'm just having a hard time seeing the grid properly. I'll take a closer look at the spacing- I thought that the drop down menu for each plant gave the spcing requirements, but maybe I'm wrong. I used the pictures mainly to show what I wanted to plant where, because I tend to get so enthused out in the garden that I forget my plans, the rules, the basics and the future growth. The plan I made will help me stay on track with what goes where, at least. LOL. I've had a look at this site and I signed up for the trial. I'm quite surprised by how much I like it. In regard to the spacing, it looks like it is done soley by space required by roots. It is definately not done by ground coverage, otherwise pumpkins would be five time the size they are in the software. There are too many variables in each of our gardens to cover all the angles in regard to spacing, I guess.